Note: This is my first new blog entry in nearly two months. The new Thai school year began in early May, and I have been a bit too overwhelmed with work to focus on completing any publishable material. I hope to return to my weekly-ish publishing pace soon. In the meantime, please check out my podcast which has several new episodes recorded during my blogging hiatus. I have previously expressed gratitude towards gun control activists who accept the meaning of the Second Amendment for what it is and honestly call for its repeal or alteration. While I disagree with these individuals politically, I have great respect for their intellectual rigor and honesty. I have no respect for those who are too ignorant to grasp the meaning of the Second Amendment. And I hold those who intentionally misrepresent it in the worst kind of contempt. A common result of ignorant or intentional misreadings of the Second Amendment is the argument that the phrase “well regulated” refers to guns or gun ownership. Another is that “the right… to keep and bear arms” is that of the militia, not average civilians. Some of those who make these fallacious arguments conclude that the Second Amendment is poorly written and should be treated as obsolete. I will concede that the Second Amendment is poorly written. However, this will not be to the delight of gun control activists. The problems with the Second Amendment are not in its meaning or purpose, but in its punctuation. Using some of the knowledge I have accrued over the years as an ESL teacher, I will explain what is wrong with the Second Amendment’s grammar. The Second Amendment is often spoken of in terms of clauses. In a grammatical sense, this is erroneous from the get-go as there is only one clause in the Second Amendment. The first half of the Second Amendment (from “A” to “state”) is not a clause at all, but something called an absolute phrase. An absolute phrase is a noun or noun phrase (a group of words used to denote one person, place, or thing) followed by a participle and attached modifiers. The noun phrase is “a well regulated militia.” The participle is “being necessary,” a present participle of the verb phrase to be necessary. The attached modifier is “to the security of a free state,” a pair of prepositional phrases. “To the security” functions as an adverb, modifying the adjective “necessary.” “Security,” a noun, is modified by “of a free state,” which means this last prepositional phrase functions as an adjective. Absolute phrases function as parenthetical adjectives that modify entire main clauses. Parenthetical elements are not essential to the main clause of a sentence. They give further details or explanations, but they do not alter the meaning of the main clause. The fossa, a large, weasel-like creature, preys on lemurs in Madagascar. Jonathan’s kidneys, which would have fetched $600 an ounce on the Swiss black market, were stolen by a public relations firm. If we remove the parenthetical elements, the fossa still preys on lemurs, and John’s kidneys are still in the hands of a company with a very strange business model. The main clauses do not depend on the parenthetical elements. It is the other way around. 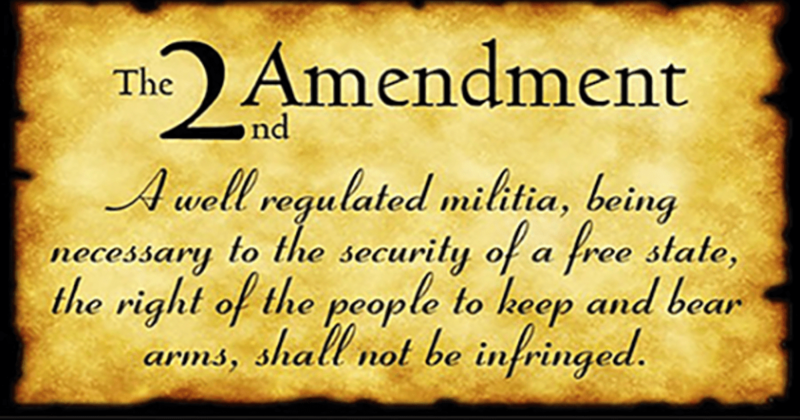 The main clause of the Second Amendment is “the right of the people to keep and bear arms, shall not be infringed.” The subject of the sentence is “the right of the people to keep and bear arms.” The predicate is “shall not be infringed.” All clauses have a subject and predicate, which is why the second half of 2A is a clause and the first half is a phrase. Here are a few examples of main clauses that follow absolute phrases with some color coding. A spotted pterodactyl whizzing past her head, the exotic dancer dropped to the earth in the fetal position. Another night’s sleep stolen by his LSD-induced nightmares, Gregory groggily got ready for work. A putrid aroma serving as the prime attraction of hagfish stew, the chef added three tablespoons of burnt hair to the culinary disaster before him. What you will notice by looking at only the blue and pink halves of each sentence is that the exotic dancer fell to the ground whether or not we know about the pterodactyl. Regardless of his drug habits, Greg was not feeling great when he brushed his teeth and tied his tie. The chef garnished his stew with burnt hair no matter why people enjoy hagfish. And the right of the people to keep and bear arms shall not be infringed… period. The absolute phrase in the Second Amendment tells us why we cannot be deprived of our right to own or carry guns. It does not tell us the conditions or circumstances that must arise for this entitlement to kick in because there are none. If conditions applied, you would be able to find subordinating conjunctions like if or when. Something else you may notice is that the Second Amendment has two commas that the other three sentences I have written do not. To the chagrin of James Madison, these commas are both comma splices, unwarranted uses of the comma. “A well regulated militia” and “being necessary to the security of a free state” are part of the same parenthetical element. There is no reason to divide them with a comma. Even worse is the comma between “the right of the people to keep and bear arms” and “shall not be infringed.” Splitting the subject of a clause from its predicate is a mistake that my students in Thailand rarely make. I do not know how this got past the other Founding Fathers and the original states as they ratified the Bill or Rights. Unlike French, there is no central authority on the English language, so technically there is no right or wrong. The English language is unregulated and subject to the whims of the public. English speakers are free to preserve the linguistic conventions they prefer and to alter the ones they do not. This goes to show that gun rights supporters who are burdened with keeping the flame of liberty alight should be stubborn and unwavering when it comes to language. Progressive and authoritarian attacks on the English language (especially from left-wing neomarxists on college campuses and right-wing neoconservative hawks) will never cease from threatening the rights that our philosophy deems self-evident. Ultimately, the Second Amendment doesn’t matter. It could be removed from the Constitution entirely tomorrow. What matters is that we stay true to our beliefs (from gun rights to free speech and beyond) and stand up to our dissenters relentlessly. Thanks for making some time during your busy schedule. While I don’t subscribe to the notion that the second (or any other amendment) is poorly written, I will concede that it is written in a language of it’s own time. This, like the parenthetical elements you have cited, does nothing to alter it’s meaning. The central point which is key is this: the RIGHT of the PEOPLE to keep and bear arms SHALL NOT be INFRINGED. The Constitution is not a document which bestows rights upon the people. It is instead intended as a document of citizen empowerment. The Bill of Rights cover what I like to think of as those amendments which delineate freedom of conscience, the individuals right to self determination in all respects. The only motive for altering or repealing the second amendment is the same as those who object to the requirement to present a valid identification in order to vote: it is for the purpose of committing some fraud upon the People. We are on the same page, my friend. Thanks for reading and commenting. Thanks for the textual analysis, including the commentary, on the extra commas.